So many things to write about in the sports world, not enough time. Every time I begin to write on a sports topic, I get distracted by another. Major league baseball’s in full swing. The NBA and Stanley Cup playoffs. The NFL Draft. I’ll write about the NBA Playoffs and the defending world champion Los Angeles Lakers. I’ll also write about some guy named Denton Ramsey. So, you’re asking yourself, “What does this Denton guy have to do with the Lakers.” Good question. Here’s the answer. He’s a Texas sports geek who writes for a site called bleacher report. He’s also a Laker-hater. Which is all well and good. 1. L.A. Is Beatable, And They May Not Even Make It To The NBA Finals. REALLY! No kidding, Denton. That’s why they call it PLAYOFFS!! If the Lakers weren’t beatable, there wouldn’t be a need for playoffs. Seems to me the Lakers were taken to the brink by Houston last post-season on their way to franchise title number 15. Denver went six in the conference finals while Orlando fell in five for the title. Could’ve gone either way in each series. But it didn’t. It went the Lakers’ way. 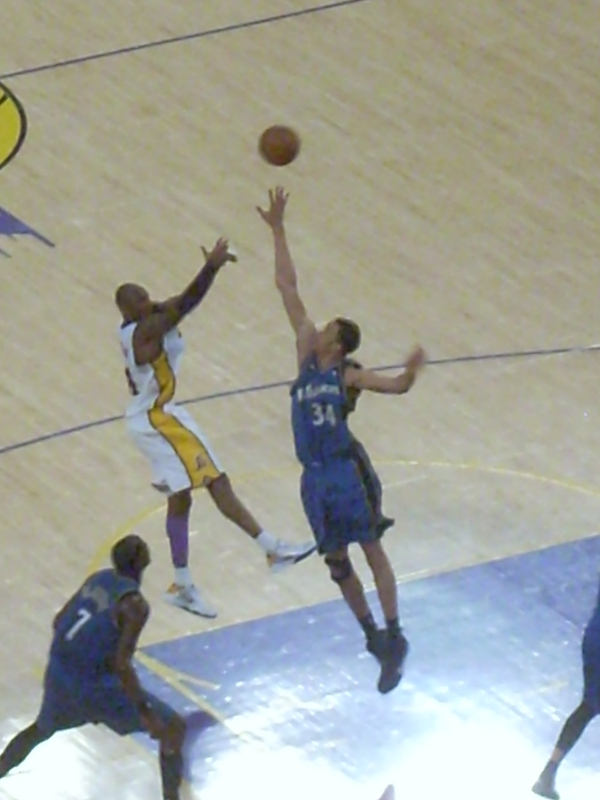 Kobe Bryant’s a creator, facilitator and the best finisher in the game today. He can score from anywhere on the floor and in the air. He can dish to anyone of his teammates from anywhere on the floor and in the air. The Lakers have a front-court of Pau Gasol, Andrew Bynum and defender Ron Artest. Off the bench comes Lamar Odom. No team in the Western Conference can handle that front court. Their only weakness is point-guard. But in “The Triangle,” a point guard isn’t the most important piece of the puzzle. None of Phil Jackson’s champions, be it in Chicago or Los Angeles, ever had a great point guard. The “quarterback” of The Triangle is the shooting guard. Kobe and some guy named Michael Jordan play the role perfectly. Anyway, the Utah Jazz will be without Mehmet Okur because of his achilles injury in the Denver series. That leaves Carlos Boozer and this 7”1” Kyrylo Fesenko-guy that helps in spurts. Kind of reminds me of the Jazz center in the 80s, 7’4” Mark Eaton. He couldn’t do anything against Kareem or Magic’s “Showtime Lakers.” This Fasenko-guy won’t do much against the quicker tandem of Gasol and Bynum. The Spurs Tim Duncan won’t be able to do much with his aging ankles and heels against Pau and Drew either. Especially in a seven-game series. Phoenix’s Amar’e Stoudemire ………… right. 2. Round Two Upset Alert. The Jazz Are Due Against the Lakers. Every round’s an Upset Alert when taking on the Lakers. But, see reason number one. That Jazz team in the 80s, with Eaton, Malone, Stockton and Bailey, was “due” against the Showtime Lakers as well. Never happened. Today’s incarnation will meet the same fate. They’re “due” having been ousted the last two playoff seasons by this Lakers’ incarnation. But, the Jazz aren’t any better than the last two years. They’re solid, play tough, have a huge point-guard advantage with Deron Williams. But, so do all the other teams in the post-season. Doesn’t matter. It’s all up front and the Jazz don’t have enough to take four out of seven from the Lakers. 3. Even If They Get Past Jazz, Spurs Still Stand In L.A.’s Way In West. Again, see reason number one. Tim Duncan is old. Well, his feet and ankles are. He can’t sustain it any longer against the young Lakers’ front line to take four out of seven. Richard Jefferson’s a bust. Manu Ginobili and Tony Parker are a bit banged-up. They beat Dallas because they’re an outside shooting team with Dirk Nowitzki. Even with Dallas’ acquisitions of Caron Butler and Brendan Haywood, it wasn’t enough. They were better defensively. But those two didn’t change their mentality on offense. The Mavs shot outside playing right into San Antonio’s hands. The Lakers will take it to the rim against the slower and older Spurs putting Duncan and company in foul trouble. Spurs could win a game, maybe two. But, they’re too old and can’t match the Lakers starters or reserves to take four games from L.A.
4. Lakers Head Coach Phil Jackson’s Final Year In L.A. Will Be Title-Less. True. Phil Jackson may not win his eleventh title as a coach this year. True. This could be his last year coaching the Lakers. That’s because his contract is up whenever the Lakers are done this year. Doesn’t mean he won’t sign another contract which is a good possibility. If he doesn’t, it doesn’t mean he’s leaving L.A. Published reports have him, possibly, moving to the Clippers and enticing LeBron James to share Los Angeles with Kobe. Those are just rumors. But, intriguing none-the-less. Oh. It’s true that Jackson’s won all these titles as a coach because he’s had all these super-stars on his teams. Wonder if Red Auerbach’s Celtics would’ve won without that hall-of-fame roster of Russell, Cousey, Havlicek, Nelson, White and Silas among others. Or maybe Red Holtzman’s Knicks with Frazier, Monroe, Barnett, Bradly, Reed, Lucas and Debusschere. How about Popovich’s Spurs with Duncan, Robinson, Ginobili and Parker. Every Championship winning coach, in all sports, has super-stars. No coach wins with second-teamers or scrubs. Anyway, if the Lakers should repeat as Champions, expect Jackson to be back on the bench next season. He’d have to go for his fourth “three-peat” if title eleven happens for him this year. 5. The Entire Team Complains Every Time They are Called for a Foul. So what. So does every player on every team. Bottom line is this. If the Lakers take the ball to the rack (which opens up the outside game) against all of their Western Conference opponents, they’ll have a smooth road to the NBA Finals. It could get a bit difficult for them if they happen to play Cleveland for the Championship. LeBron’s Cavaliers have added parts like Shaq to beat Dwight Howard and the Magic in the Eastern Conference and, maybe, the Lakers in the Finals. But, if I were a betting man, I’d STILL bet on the Lakers to win it all. Do I hear chants of “3-Peat” yet?